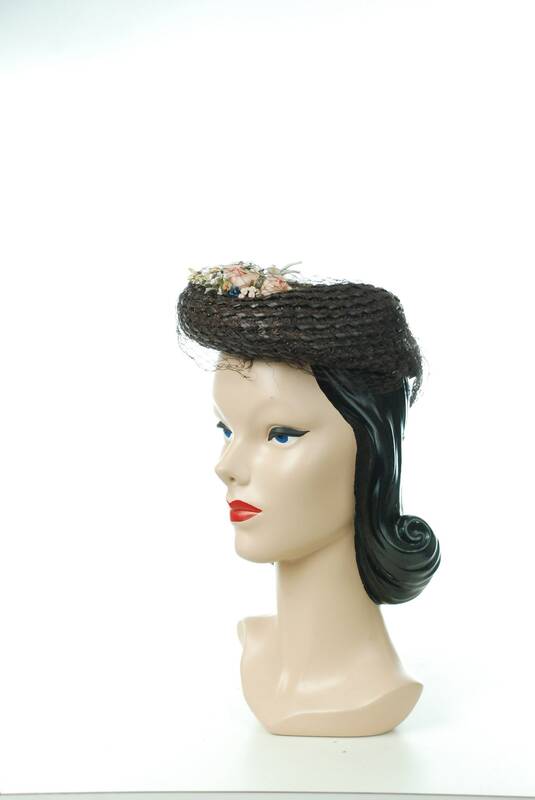 This vintage 1940s hat is a lovely spring style, made of carefully blocked woven sythentic straw in two different textures. The crown is slightly indented. 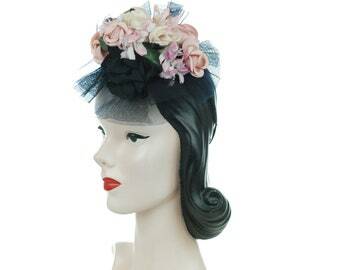 A detailed millinery bouquet rests in that small dip, covered with a bit of fine veiling. The interior is trimmed with grosgrain. Interior Circumference: 20.5, but this tilt style should fit all heads. 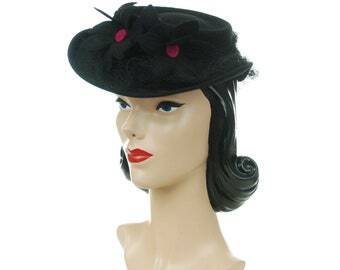 This hat wears beautifully and is ready to enjoy. 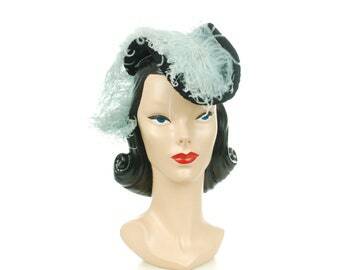 The veiling is rather broken, but not worn in a way that this has any real impact. I have streamed out some creasing from storage. Your gift will be wrapped with a classic wrapping paper and tied with satin ribbon. Please enter the text for your note to the recipient at checkout. This sale is valid only on marked items. All consignment items are excluded. The sale is not valid on current or new reserves or layaways. May I reserve an item or put an item on Layaway? To serve you better, Layaway is available for items over $100. 30, 60 and 90 day terms are available, based on the value of the item(s) you are ordering. Items between $100 and 300.00 may be set up on a 30 day layaway, and items over $300 may be put on 60 day extended layaway plan if desired. Items over $1000 may be put on a 90 day plan. Layaway cannot be combined with sale prices, coupons or other discounts. Customers may put more than one item on Layaway, but the prices cannot be combined to extend the length of the layaway. There is a 2-hour waiting window on new listings before they may be put on Layaway or Reserve. 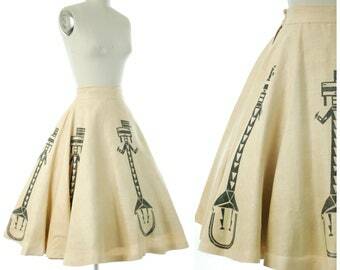 You may write on a new listing to be put in the queue for layaway. The measurement look larger than the mode/dress form. Is this item pinned? Yes, it is. All items larger than the form are pinned too represent their accurate fit and shape. We are careful to accurately represent the actual cut of the garment. Don't rely on the size of the model in any way. I have an issue, may I return an item? I allow returns or exchanges in only rare occasions - only when I have made an egregious error. You must contact us with 48 hours of receiving your order if you have an issue, and if an exchange is approved, it must be sent within 48 hours after our communication. Items purchased and worn for special events may not be returned - we are not a rental facility. No refunds are issued based on issues with the fit of a garment, please measure carefully and feel free to make inquiries if you need help with sizing. Vintage lingerie cannot be returned or exchanged, due to its intimate nature. Clearance items, items noted "as-is" and items sold on layaway may not be returned or exchanged. Only accessories original to the piece and specifically described in the listing are included with purchase. All contrasting belts, necklaces, scarves or other items on mannequins or models are for inspiration only and are not included. All included pieces, including original self-fabric belts will be clearly and explicitly described in the listing.